​1818 - Doctor Victor Frankenstein creates his monster. ​1820 - Frankenstein's Monster is set adrift on an artic ice floe. ​1862 - Frankenstein's Monster encounters the Sheedan Empire Time-Seeds, and fights off their invasion with his future-self. ​1866 - Frankenstein's Monster befriends a young Lady Angela in Belgium who makes his steam-gun. He takes his creator's name. ​1886 - Frankenstein stops Mr. Hyde's rampage in Paris. ​1898 - Frankenstein fights the "Martian" invasion of England. When Lady Angela is killed, he steals a Martian dropship and goes to their planet, beginning his genocide. ​1901 - Frankenstein fires himself back to Earth using a Martian Invasion Cannon. ​1911 - Frankenstein wields the sword of the Archangel Michael against the Maggot King, and is buried under London. ​1932 - Frankenstein is recovered by S.H.A.D.E. and becomes their operative. ​1939 - Frankenstein becomes the leader of the S.H.A.D.E. wartime assault team, the Creature Commandos. 1945 - the Creature Commandos join the final push into Berlin. they discover Vandal Savage's attempt to clone a new body for Hitler, initiating the Secret War. 1947 - Frankenstein is lost in the Atlantic during the final mission to kill Hitler's Brain. 18 years ago - Frankenstein is recovered by the DEO, who commission him to battle his old employers, S.H.A.D.E. 14 years ago - Frankenstein joins the new Freedom Fighters. 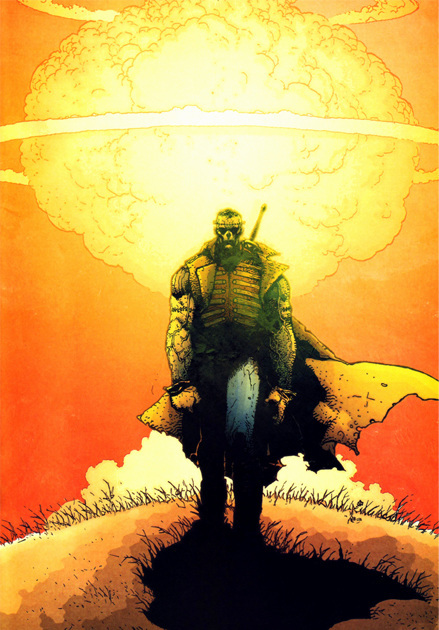 ​8 years ago - Frankenstein battles the Sheedan Empire and their Time-Seeds with his past-self. Frankenstein's monster has been a part of DC's universe for a long time, dating all the way back to the early Bob Kane Batman stories. The actual character from the original novel is obviously in the public domain, but the classic Universal version of the character with his trademark neck-bolts is copyrighted by Universal Pictures. This obviously didn't stop many depictions of the character from looking practically identical to the iconic Boris Karloff character but with small alterations to avoid copyright infringement. Usually, simply moving the bolts from the neck to the temples. DC wasn't alone in doing this; comics depicting variations on the original monster were rampant. 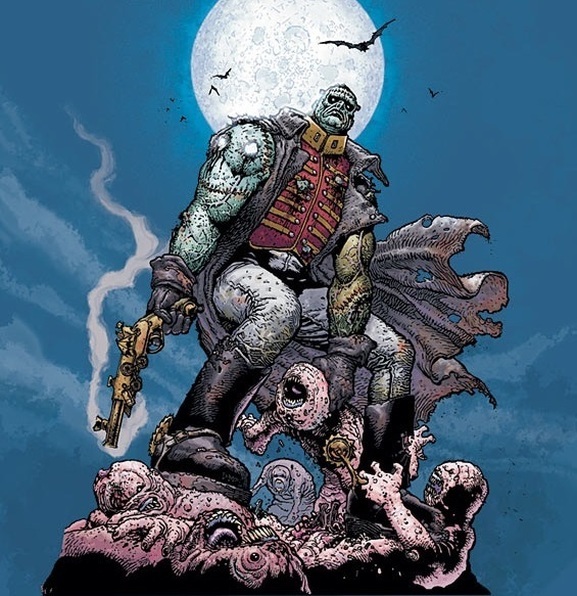 The genesis of this particular version of Frankenstein's monster has to be traced to the comic Doc Frankenstein by the Wachowskis of Matrix fame, which imagined a version of the monster having lived through the intervening centuries and involving himself in world history. 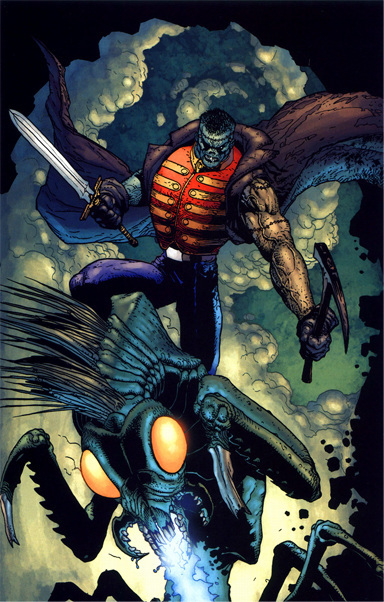 When Grant Morrison was crafting his new version of the Seven Soldiers of Victory he clearly took elements of this idea and infused them with a surreal blend of magic and steampunk to create something completely new. His Frankenstein was a time-lost immortal warrior wielding the sword of an archangel and battling civilization-harvesting spider-fairy-scorpions from the future. We are fully aware that we constantly fanboy about Grant Morrison. We've made our peace with it. Comics are rarely more fun than when he begins sculpting continuity like a mescalin fever-dream. Part of what makes Frankenstein so much fun is that his adventures are so completely insane while still keeping one foot firmly planted in his literary background. We've deliberately kept to the version of the character as featured in the original novel, using the original publication date to begin his story. We've peppered his timeline with references to other great works of early science fiction. He battles Mr. Hyde in France, and the 'Martian" Invasion from War of the Worlds. Obviously, we already know what Martians look like thanks to a certain Justice League mainstay, but there's no reason another invading species couldn't have populated the planet after the fall of J'onn's people and attacked Earth at the turn of the century. To really push this story, we've actually had Frankenstein lose the one person who treated him like an equal in that attack, so he launches himself to the surface of Mars and commits wholesale genocide on the invading martians. This is a character that encourages this sort of thing. We've incorporated a little bit of Morrison's Sheedan Empire; time travel is obviously something we're avoiding, but a quick jaunt to meet his past self in a contained story won't hurt anything. His time with the Creature Commandos, S.H.A.D.E. and the modern Freedom Fighters all fit well with the character, and give us something to build on to bring this wildly innovative character further into the regular DC universe. Plus, if there was ever a character that deserves to fight Hitler's Brain, it's Frankenstein.